PT Bank Tabungan Negara (Persero) Tbk - Bank BTN an established state-owned financial services company in Indonesia with strong business focus on general banking industry. Bank BTN has business competencies on mortgage segment. As at the end of December 2016, Bank BTN maintains 33.57% market share of mortgage loans segments in Indonesia. 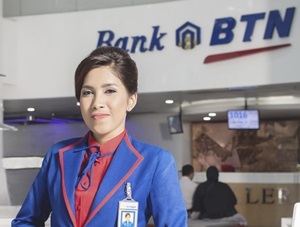 Bank BTN is domiciled in Jakarta and has 4 regional offices, 71 branch offices, 242 sub branch offices, 478 cash outlets, 65 sharia outlets, 39 priority outlets, and 1,964 ATMs spread across Indonesia. 10,360 employees. Established since 1897, Bank BTN is widely known nationwide as one of the oldest banks in Indonesia. Bank BTN was first established in 1897 during the Dutch Colonial era and initially registered as Postspaarbank. In 1950, the Bank transformed to Bank Tabungan Pos, and then renamed to Bank Tabungan Negara in 1963. In December 2009, the Bank went public and conducted its initial public offering (IPO) on the Indonesia Stock Exchange (IDX). Bank BTN's shares are listed on IDX under reference BBTN. As of December 2017, PT Bank Tabungan Negara (Persero) Tbk is 60% owned by the Government of Indonesia and 40% by public shareholders (10.05% local investors and 29.95% foreign investors). According to information found in PT Bank Tabungan Negara (Persero) Tbk Annual Report 2017 as cited by JobsCDC.com. Bank BTN booked total comprehensive profits of Rp3,056.67 billion in the business year of 2017. This total comprehensive profits down 45.72% year-on-year (YOY) from Rp5,631.61 billion in 2016. Total operating income in 2017 amounted to Rp3,891.90 billion or up 16.10% from Rp3.352.23 billion in 2016. Referring to its annual report, Bank BTN posted Rp261,365.26 billion in total assets for the full year of 2017, an 22.04 % increase from Rp214,158.47 billion in the same period of last year. Single/not married and willing to not marry during 2 years of service bond. Minimum Diploma 3 (D3) holder or the candidates from Senior High School (SLTA) are welcome to apply. The candidates with prior experience as a Teller for minimum 1 year is preferred. Minimum GPA of 2.75 out of 4.00 grade scale for D3 and minimum national exam score of 7.00 out of 10.00 grade scale for SLTA. Minimum height of 160 cm for Male dan 155 cm for Female. Preferably physically proportional and have pleasant appearance. Have no family relation with Bank BTN such as parents or siblings. Maximum age of 24 years old. (not yet turning 25 years old by the year of the recruitment). Minimum Diploma 3 (D3) holder with minimum GPA of 2.75 out of 4.00 grade scale. Have no family relation with Bank BTN employee such as parents or siblings . JobsCDC.com now available on android device. Download now on Google Play here. Please be aware of recruitment fraud. The entire stage of this selection process is free of charge. PT Bank Tabungan Negara (Persero) Tbk - Walk in Interview SMA, D3 Fresh Graduate BTN July 2018 will never ask for fees or upfront payments for any purposes during the recruitment process such as transportation and accommodation.